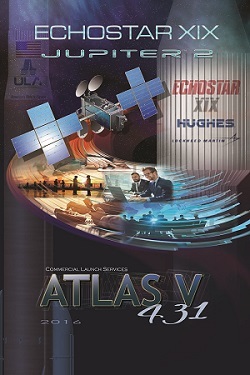 Good evening – everything is progressing toward the ULA Atlas V launch carrying the EchoStar XIX satellite. The mission is set to lift off on a ULA Atlas V rocket on Sunday, Dec. 18 from Space Launch Complex-41 at Cape Canaveral Air Force Station in Florida. The launch window is 1:27-3:27 p.m. EST. Today’s L-3 forecast shows a 70 percent chance of favorable weather conditions for launch. Editor’s Note: This flight will be ULA’s 12th launch of the year and the 22nd and final American launch for 2016. SpaceX completed eight launches and Orbital ATK flew twice. Quite happy to see Atlas fly a commercial payload. But apparently the main reason this happens was a difficulty with dual-manifesting on Arianne 5. Vulcan can’t come soon enough. Interesting how between flying OATK Cygnus and Ariane “overflow” that it’s ULA that is the “nimble” company you go to when you need a quick launch. I want all the US launch companies to succeed, and it’s interesting how each has different problems (as Doug is alluding to). ULA needs to work on sales and cost, SpaceX needs to work on reliability and scheduling, OATK needs some combination of reliability/operations/sales/etc. I think ULA demonstrated their nimbleness with launch of UFO satellites, so OTK new that they can pick up Cygnus launches quickly (about 1 year).